Wizard is similar to classic Inno Setup Wizard. We will describe only differences between them. Please remember: Wizard does not cover all features of Inno Setup. 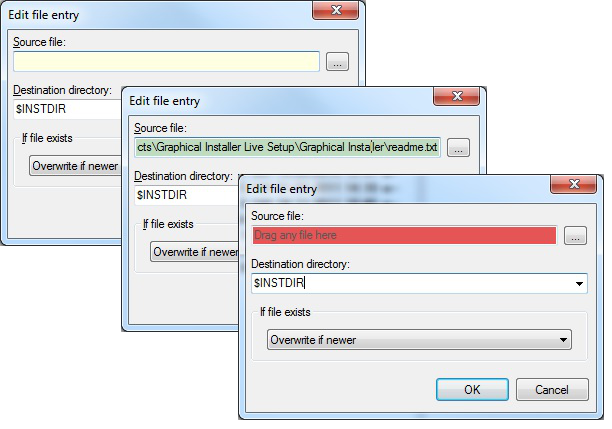 Option 'Create new script file' will create only basic skeleton of your installer (but with all features from Graphical Installer package like background, skinned buttons, ...). 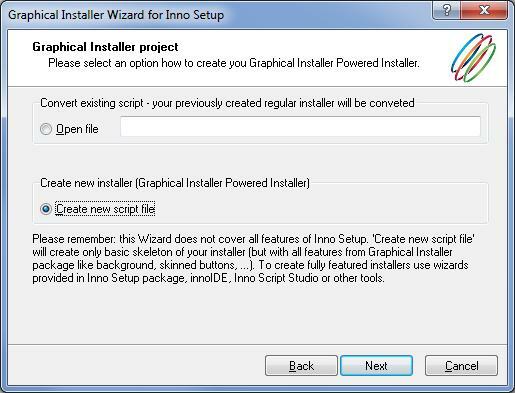 To create fully featured installers use wizards provided in Inno Setup package, innoIDE, Inno Script Studio or other tools. Press F1 (or click the question mark symbol in the corner of window) anytime to show help for current page of Wizard. You can find version information on this page (marked with bold font). 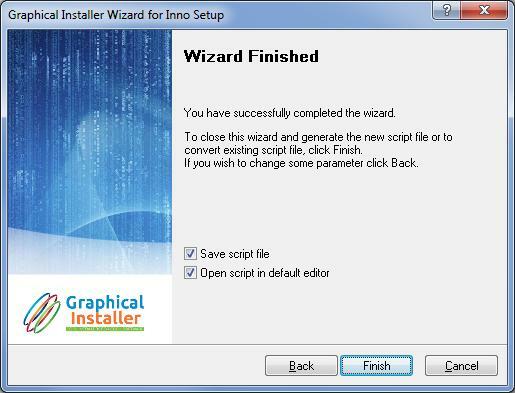 It describes compatibility of Wizard and Graphical Installer. Choose one option - what action you would like to perform. If you choose option Open file the Wizard will skip page Application Information and show page Graphic settings. This page is skipped if you choose option Open file in Page Graphical Installer project. 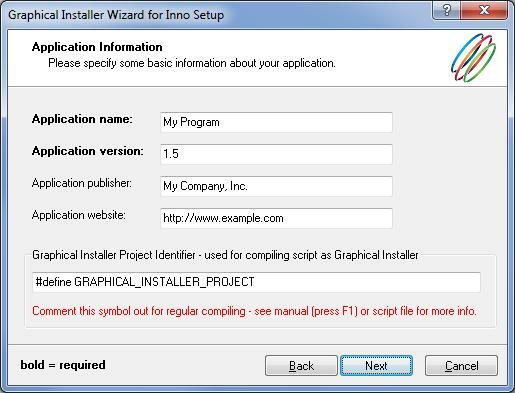 There is read only edit box added to this page called Graphical Installer Project Identifier which is used for compiling script as Graphical Installer. This identifier is also used to recognize <project>.iss file and <project>.graphics.iss. 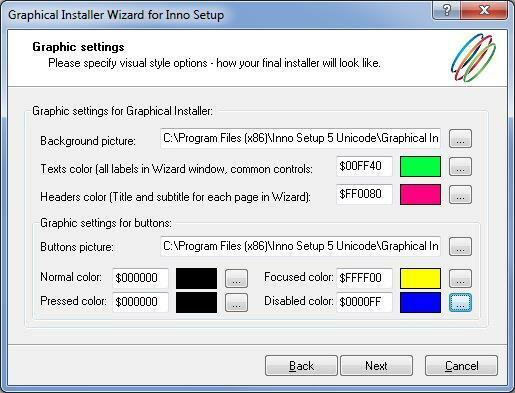 This page contains all visual style option required for proper skinning of Inno Setup installer. 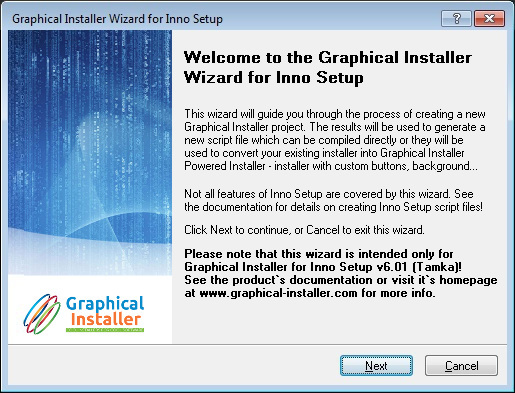 It is the most interesting page for Graphical Installer Wizard. Field Background picture represents the main image for installer's skin. Write path to desired file or click button Browse to select file from your machine. Field Texts color defines color for common texts in installer. You can type color manually as $RRGGBB or click button Browse to select desired color from color selection dialog. Field Headers color defines color for headers texts in installer. Field Buttons picture represents the image for installer button. Field called Normal color defines color for all buttons in installer. Field called Pressed color defines color for buttons in installer when the button is pressed down. Field Focused color defines color for all buttons in installer when the button received focused. Field Disabled color defines color for buttons in installer when the button is disabled. Tip: For background picture use image with 690 x 496 pixels. This must be set! Supported formats: .bmp .jpg .gif .png .tif. For button picture use .png image with 80 x 136 pixels. This must be set! When you press the Finish button all changes you made will be written into <project>.iss and <project>.graphics.iss files. You can select project name and location in Save dialog. Background image will be converted - you can notice it as a black-console window which opens for few seconds when the script is being written to file. In few moments generated files - main project.iss file and <project>.graphics.iss file are opened in default Inno Setup editor. Background of the installer consists from three separate images: the background image itself - this one you choose in Wizard - and the inner dialog’s image, top image and bottom image (generated automatically by extern application from Wizard). However you choose only background image the inner dialog’s image is also used to redraw installer’s dialogs controls, so it must be created. If you are importing some skin or image, you need to generate this small image manually – run the BitmapCutter.exe tool (see BitmapCutter for more info). Anytime you see an yellow field (usually with some hint like 'Drag file here') in dialog, you can use Drag and Drop to select file into this field to speed up your work. If correct file is used the field turns green. On wrong file it turns red.